Chiswick House Friends is a charitable trust founded in 1984 by local residents to support the preservation & enhancement of Chiswick House and its Gardens. The web server with the IP-address 81.187.42.237 used by Chfriends.org.uk is owned by Watchfront Limited and is located in Arnold, Great Britain. This web server runs a few other websites, mostly in the english language. 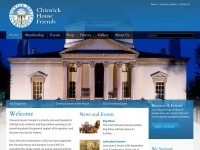 The websites of Chfriends.org.uk are hosted by a Apache server and were developed in the programming language PHP. The content management system WordPress is used. The HTML pages were created with the latest standard HTML 5. The visitor analysis software Google Analytics is used to analyze the visitors of the websites. Due to the robot information on the webpage, the following actions by webcrawlers are not allowed: using the description of the website from the Open Directory project. All other actions by webcrawlers are allowed.